Friends of the Lower Field River is a land care group established by Hallett Cove residents in 2006 to protect and care for the lower portion of the Field River and its environs. This area includes Cormorant Reserve, the river's estuary at Hallett Cove Beach and nearby sand dunes. Over the years this area has been degraded, but it retains huge potential into the future. Our aim is to gather support from the community and work towards the rehabilitation and protection of these areas. Unless long-term plans are made and all of the community comes together, the degradation may not be able to be reversed. Friends of the Lower Field River believes that all of the community should be seen as guardians of this area's exceptional natural beauty and we are keen to pass onto future generations something they can all feel proud of. 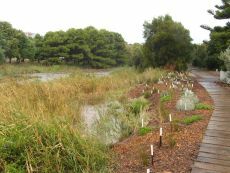 We have developed an action plan outlining our priorities and targets for the next few years and together with the City of Marion (the owners of the reserve) and other interested parties we plan to improve the condition of this urban river, control weeds, protect and enhance coastal dune vegetation and plant indigenous shrubs, trees and grasses. Even the smallest of works will start bringing native animal and bird life back into the area. Once this starts, momentum will build and we will have an environmental gem on our doorstep.